"Grounds for opposition - subject-matter extends beyond content of earlier application" – "Amendments - undisclosed disclaimer" – "Fundamental question of law" – "Divergence in case law" – "Sufficiency of disclosure" – "Novelty over transient rather than intermediate product in prior art (point 5.4 of the reasons)" – "Inventive step" – "Validity of priority claim"
I. This decision concerns the appeals filed by opponents 1 and 3 and the patent proprietor against the decision of the opposition division that European patent No. 1 933 395 as amended met the requirements of the EPC. II. With their notices of opposition, the opponents had requested revocation of the patent in its entirety on the grounds under Article 100(a) (lack of novelty and inventive step), 100(b) and 100(c) EPC. D54: S. Sprouse et al., J. Am. Chem. Soc., volume 106, 1984, pages 6647 to 6653. Claims 2, 9 and 10 of the main request did not comply with Articles 76(1)/123(2) EPC. wherein the ligand is an α-amino acid residue selected from glycine, L-alanine, L-valine, D-leucine, L-proline, or L-phenylalanine." The disclaimer in claim 1 had been introduced in view of D5. The opposition division considered this disclaimer to meet the requirements established in G 1/03, because D5 was an accidental anticipation. Furthermore, the feature of a monoanionic bidentate ligand was based on the application as filed, inter alia page 12, lines 11 to 17. The invention as defined in claim 1 was sufficiently disclosed. Any non-phosphorescent organometallic complex was outside the scope claimed, and whether the skilled person knew when he was working within the claimed scope was a matter of Article 84 EPC. The claimed subject-matter was novel over D3, D5 and D6, but lacked novelty over D7. In claim 1 of the second auxiliary request, a second disclaimer ("wherein X is not picolinate") had been introduced. This disclaimer was not allowable under Article 76(1) EPC, since it created a subclass of compounds which was not clearly and unambiguously derivable from the application as filed and hence failed to pass the test established in G 2/10. "1. Phosphorescent organometallic compound of formula L2IrX, wherein L and X are inequivalent bidentate ligands, X is a monoanionic bidentate ligand, and the L ligands are monoanionic bidentate ligands each coordinated to Ir (iridium) through an sp2 hybridized carbon and a heteroatom, and wherein X is selected from the group consisting of acetylacetonate, hexafluoroacetylacetonate, salicylidene, and 8-hydroxyquinolinate." The third auxiliary request met the requirements of Article 76(1), Rule 80 and Article 123(3) EPC. Sufficiency was acknowledged for the same reasons as for the first auxiliary request. The subject-matter of the third auxiliary request was furthermore novel, since ligand X as defined in claim 1 was not disclosed in any of D3, D5, D7 and D54 (denoted D43 by the opposition division). Lastly, inventive step was acknowledged. The subject-matter of claim 1 differed from the closest prior art D2 in that the ligands co-ordinated with the central metal atom were not all the same. The problem solved in view of D2 was the provision of further phosphorescent organometallic complexes and this document did not suggest that complexes as claimed would solve the given problem. D58: EP 2 270 895 A2. V. On 26 February 2014, the proprietor filed an appeal. The statement setting out the grounds of appeal was filed on 28 April 2014, including a main and first auxiliary request. VI. Responses to the respective statements of grounds of appeal were filed by opponents 1 and 3 and the proprietor, the proprietor's reply containing second to fourth auxiliary requests. VII. With letter dated 19 January 2015, opponent 2 withdrew its opposition. VIII. As all the remaining parties are both appellant and respondent in the present appeal proceedings, for simplicity the board will continue to refer to them as opponents 1 and 3 and the proprietor. IX. On 23 November 2015, the parties were summoned to oral proceedings, and on 13 January 2016 the board issued its preliminary opinion. X. With letter dated 1 March 2016, opponent 3 announced that it would not be attending the oral proceedings. XI. With letter dated 18 March 2016, opponent 1 provided further arguments and announced that Dr Stößel would attend the oral proceedings as a technical expert and would make submissions, if necessary. XII. With letter dated 24 March 2016, the proprietor requested that Professor Thompson be heard as a technical expert during the oral proceedings and submitted his CV. XIII. On 28 and 29 April 2016, oral proceedings were held before the board. Opponent 3 was not represented. After the discussion of the requirements of Articles 123(2) and 84 EPC as regards the main request, opponent 1 withdrew its objections under Article 84 EPC. Furthermore, the proprietor replaced the main request with a new main request the admissibility of which was not objected to by opponent 1. The proprietor furthermore requested that a set of questions as regards the allowability of disclaimers be referred to the Enlarged Board of Appeal and submitted a proposal for such questions. The proprietor acknowledged that the final wording of the referral questions shall be determined by the board. During the oral proceedings, opponent 1 did not object to the proprietor's expert Professor Thompson making oral submissions and did not ask for Dr Stößel to be heard. The main request was not based on the application as filed. The two disclaimers in claim 1 did not meet the criteria established in G 1/03, since the two documents D5 and D7, which were the basis for the disclaimers, were not accidental anticipations. Furthermore, the criteria of G 2/10 were not met. By the disclaimers, the subject-matter remaining in claim 1 had been restricted to such an extent that a new combination of features had been created. The subject-matter remaining in the claim was thus not directly and unambiguously disclosed in the application as filed. Claim 1 did not meet the requirements of Article 123(2) EPC for the further reason that a complex L2MX with M being Ir and L being a "monoanionic" bidentate ligand was not based on the application as filed. Lastly, the combination of features of each of claims 4 and 5 with those of the preceding claims was not based on the application as filed. The invention as defined in the main request was insufficiently disclosed. Not all complexes falling under the structural definition of claim 1 were phosphorescent and the patent did not provide any guidance about how to identify the phosphorescent compounds without undue burden, resulting in the mere invitation to start a research programme. In this respect, the proprietor's argument that the skilled person could select suitable structures by determining the triplet energy levels of the L relative to the X ligands was not convincing, since it was impossible to measure these energy levels. Furthermore, the patent did not sufficiently define to what extent and under which conditions the compound according to claim 1 had to emit phosphorescent light in order to qualify as being phosphorescent. The subject-matter of the main request lacked novelty over D57 and D58. These documents formed prior art since, in view of the two disclaimers in claim 1, this claim did not enjoy the priority of the patent. Furthermore, the claimed subject-matter was anticipated by the structure disclosed in D3, the intermediate product Ir(ppy)2acac as formed and disclosed in D6 and compounds [Ir(ppy)2Cl]2 and [Ir(bzq)2Cl]2 of D54. The claimed subject-matter lacked inventive step. It differed from the closest prior art D2 in that one of the three identical ligands of the compound disclosed in D2 had been replaced with a different one. The objective technical problem was the provision of an alternative phosphorescent compound and the solution was obvious in view of D3 or any of D5 to D7. For the same reasons, the claimed subject-matter lacked inventive step in view of D4 as the closest prior art. Lastly, it would have been obvious to reduce the reaction time in D6 to obtain an intermediate product identical to the compound defined in claim 1. The main request was based on the application as filed. The two disclaimers in claim 1 met the criteria established in G1/03, since D5 and D7 were accidental anticipations. The properties disclosed in D5 and D7 for the claimed complexes had no bearing on OLEDs. More specifically, the photoluminescent and electrochemical properties referred to in these documents were irrelevant to the electroluminescent properties needed for OLEDs. The two disclaimers furthermore met the criteria established in G 2/10 since they reduced the broad genus of claim 1 to only a minor extent. As regards the allowability of undisclosed disclaimers under G 2/10, a question should be referred to the Enlarged Board of Appeal. As regards the definition of the structure L2IrX in claim 1, page 12, lines 11 to 15 as filed provided a basis for the more general structure L2MX with L being a monoanionic bidentate ligand. 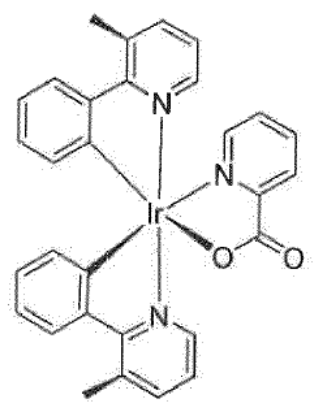 A pointer to the combination of this structure with the definition of metal M as iridium was furthermore present on page 4, lines 4 to 7 of the application as filed. Lastly, claims 4 and 5 including the back-references to the preceding claims were based on page 17, lines 20 to 25 of the application as filed. The invention as defined in the main request was sufficiently disclosed. The patent provided sufficient guidance to select compounds falling under the structural definition of claim 1 that had phosphorescence. More specifically, the patent provided numerous examples of compounds together with their emission spectra that were phosphorescent, as evidenced by the lifetimes contained in several of these spectra. Furthermore the patent taught the skilled person to use ligands L that had a high fluorescent quantum efficiency and a lower triplet energy level than ligands X. By following this teaching the skilled person could identify suitable complexes and could avoid the failures referred to by the opponents. In this respect, opponent 1's new objection that triplet energy levels could not be determined should not be admitted into the proceedings. Should the board deny sufficiency on the ground that the meaning of the term "phosphorescence" in claim 1 was unclear, a question should be referred to the Enlarged Board of Appeal. The subject-matter of the main request was novel over the cited prior art. 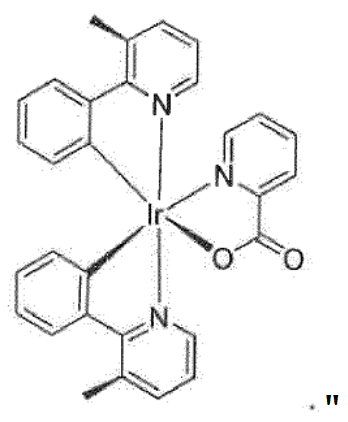 The compound disclosed in D3 differed from the claimed one in that its ligand was dianionic and tetradentate. The intermediate compound disclosed in D6 was not available to the public since it was only presented as part of a hypothetical reaction scheme, and not as a result of the reaction described in D6. If present at all during this reaction, it would have been fully converted to the final product after the reaction time of 10 hours disclosed in D6. The opponent's evidence D55 and D56 filed in this respect should not be admitted since it was not prima facie relevant. Like the reaction scheme in D6, D55 was purely hypothetical and D56 was not a proper reworking of the teaching of D6 since the reaction was already stopped after one hour. Furthermore, the mass spectrogram in D56 was no proof that the relevant intermediate was indeed present. The compounds disclosed in D54 were not novelty-destroying either, since these compounds were symmetrical, and the mental split of the structure into two unequal parts, as performed by the opponents, was purely theoretical. Furthermore, the two bonds from the two Cl atoms to one Ir atom in these compounds were not two dents of a bidentate ligand but represented a resonance of two monomers of which the dimer was formed. Lastly, the novelty attacks on the basis of D57 and D58 should not be admitted into the proceedings since the priority of the patent was valid and thus the two documents lacked prima facie relevance. The claimed subject-matter was inventive. It differed from the closest prior art D2 in that one of the three identical ligands of the compound disclosed in this document had been replaced with a different ligand X. The problem solved in view of D2 was to allow for colour tuning of OLEDs, and figure 37 of the patent showed that this problem had been credibly solved. Neither D2 nor any of the further documents addressed this problem or provided any motivation to replace one of the three identical ligands in D2 with a different one. D5 and D7 were in a completely different technical field and thus would not even have been considered by the skilled person. The opponent's inventive-step attack on the basis of D4 was not convincing either, since D4 was not prior art, as evidenced by D51. Apart from that, the same arguments as for D2 applied to D4. XVII. The opponents requested that the decision under appeal be set aside and that the patent be revoked. the third or fourth auxiliary request filed with letter dated 22 December 2014.
a question be referred to the Enlarged Board of Appeal concerning the allowability of disclaimers in view of G 1/03 and G 2/10. 1.1 The main request was filed during the oral proceedings before the board. This request differs from the main request filed during the written proceedings by the deletion of claims 6 to 9. During the oral proceedings, opponent 1 had argued for the first time that the claims of the main request filed during the written proceedings contained added matter, namely that the combination of acetylacetonate as X-ligand with a six-membered ring (claim 6) and the location of the compound L2MX in the claimed devices (claims 7 to 9) was not based on the application as filed. The deletion of claims 6 to 9 in the main request was thus a reaction to new objections raised by opponent 1 for the first time during the oral proceedings. In view of this, the board decided to admit this request into the proceedings. Opponent 1 did not object to that. 2.1 The opposed patent was granted on a divisional application of an earlier European patent application (parent application). The present (divisional) application as filed and the parent application as filed are - apart from the claims - identical. 2.2 Claim 1 contains two disclaimers which were objected to by opponents 1 and 3 as not meeting the criteria of G 1/03 and G 2/10. This issue will be discussed in points 7 to 10 below. 2.3 Leaving aside the issue of the disclaimers, claim 1 is based on page 13, lines 9 to 10 (phosphorescence) and page 12, lines 11 to 15 in conjunction with page 4, lines 4 to 7 (remaining features) of the application as filed. "The invention is further directed to organometallic complexes of metal species M with a bidentate monoanionic ligand in which M is coordinated with an sp2 hybridized carbon and a heteroatom at the ligand. The complex may be of the form L3M (wherein each ligand L species is the same), LL'L''M (wherein each ligand species L, L', L'' is distinct), or L2MX wherein X is a monoanionic bidentate ligand." The first sentence of this passage requires the complex to have a bidentate monoanionic ligand in which M is co-ordinated with an sp2 hybridised carbon and a heteroatom at the ligand. The next sentence gives examples of such complexes, the first one being complexes of the formula L3M. The only ligand present in this complex is ligand L. Consequently, based on the definition in the first sentence, L must be a bidentate monoanionic ligand co-ordinated to M with an sp2 hybridised carbon and a heteroatom. The same ligand L is present in the further example given in this sentence, namely in complex L2MX. Hence also in this complex, which is the one of claim 1, L must be a bidentate monoanionic ligand co-ordinated to M with an sp2 hybridised carbon and a heteroatom. This definition of L is identical to the definition of L in claim 1. 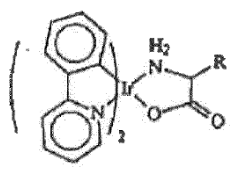 Furthermore, page 4, lines 4 to 7 of the application as filed provides a pointer to the combination of this structure L2MX with iridium as the preferred metal M. There is thus at least a clear pointer to M being Ir in the complex L2MX, with L being a monoanionic bidentate ligand. 2.4 Opponent 3 argued that the combination of the features of each of claims 4 and 5 with those of the preceding claims was not based on the application as filed. Claim 4 defines ligand L as being selected from a list of 9 compounds (2-phenylbenzoxazole is mentioned twice) and claim 5 defines ligand X as being selected from a list of 5 compounds. Page 17, lines 20 to 23 of the application as filed discloses 11 compounds for ligand L, of which 9 are cited in claim 4, and page 17, lines 24 to 25 discloses five examples of ligand X, all of which are present in claim 5. The definitions for ligands L and X are disclosed in general terms in the above-mentioned passages of the application as filed. The skilled person reading the application as filed would therefore directly and unambiguously derive therefrom that these definitions apply to all embodiments disclosed in the application as filed, and hence that the disclosure of the ligand X also applies to and thus can be combined with that of the ligand L. Consequently, claims 4 and 5 are based on the application as filed. 2.5 In view of the above, and leaving aside the disclaimers present in claim 1, the claims of the main request are based on the application as filed and thus meet the requirements of Article 123(2) EPC. Since, as mentioned above, the description of the application as filed is identical to the description of the parent application as filed, the claims also meet the requirements of Article 76(1) EPC. 3.1 During the oral proceedings, opponent 1 withdrew its clarity objections. The only remaining objection from opponent 3 related to a claim - claim 1 of auxiliary request 3 found allowable by the opposition division - which is not present in the main request. 3.2 In view of the fact that there were thus no longer any objections outstanding from opponents 1 and 3, and since the board does not see that any lack of clarity has been introduced into the claims by way of amendment, the amendments in the claims meet the requirements of Article 84 EPC. 4.1 The complex referred to in claim 1 is defined in structural terms as L2IrX, i.e. in that it contains one metal, namely Ir, two ligands L and one ligand X, whereby (a) the two ligands L are monoanionic bidentate ligands each co-ordinated to the metal Ir through an sp2 hybridised carbon and a heteroatom and (b) ligand X is a monoanionic bidentate ligand that is not equivalent to ligand L. At the same time, the complex is functionally defined as being phosphorescent. As already set out in the related cases T 323/13 (point 7.1.1 of the reasons) and T 544/12 (point 4.2 of the reasons), defining a group of compounds in a claim by both structural and functional features is generally acceptable under Article 83 EPC as long as the skilled person is able to identify, without undue burden, those compounds - out of the host of compounds defined by the structural feature(s) in the claim - which also fulfil the claimed functional requirement(s). Sufficiency of disclosure may for instance be acknowledged if all embodiments defined by the structural feature(s) of the claim also meet the claimed functional requirement(s). If this is not the case, sufficiency may still be acknowledged if the common general knowledge at the priority date of the patent, or the patent itself, provides the skilled person with sufficient guidance on how to select those compounds, out of the host of compounds defined by the structural feature(s) of the claim, that also meet the claimed functional requirement(s). 4.2 In its statement of grounds of appeal (letter dated 30 April 2014), opponent 3 cited eight iridium complexes with acetylacetonate ligands X falling under the structural definition of claim 1 that had either a very weak emission or none at all. The opponents argued that thus not all complexes falling under the structural definition given in claim 1 were phosphorescent and that the patent did not provide the skilled person with sufficient guidance to select complexes, falling under the structural definition of claim 1, that showed phosphorescence. 4.3 The board acknowledges that indeed not all complexes tested by opponent 3 and falling under the structural definition of claim 1 are phosphorescent. The board does not however agree with the opponents' remaining argument that proper guidance was missing in the patent to select those complexes that were phosphorescent. 4.4 Firstly, the patent contains numerous examples of specific compounds having structures as required by claim 1 which are phosphorescent (figures 8, 10, 12, 14, 16, 17, 19, 21, 25, 26, 27, 29, 31, 33, 35, 36 and 37). These examples give the skilled person at least some idea of suitable structures which fulfill the functional requirement of claim 1 of being phosphorescent. 4.5 Secondly, the patent even provides specific selection rules on how to identify ligands L and X within the structural definition of claim 1 that lead to phosphorescent compounds. More specifically, the patent teaches in paragraph  to use ligands L that have a high fluorescent quantum efficiency, since that makes it possible to use the strong spin orbit coupling of the Ir metal to efficiently intersystem cross in and out of the triplet states of the ligands. The concept behind this is that the iridium makes the L ligand an efficient phosphorescent centre. Furthermore, the skilled person is taught by paragraph  to use ligands X that have higher triplet levels than the L2Ir framework. Otherwise the energy from the triplet levels of the L ligands is transferred to the triplet levels of the X ligands such that emission comes from the X rather than L ligands. Consequently, the patent provides a general teaching of how to obtain complexes falling under the structural definition of claim 1 that are phosphorescent. This teaching would also enable the skilled person to avoid the failures reported by the opponents. More specifically, all complexes cited in opponent 3's statement of grounds of appeal contain a pyrazol or similar structure in ligand L and acetylacetonate (acac) as ligand X. As confirmed by the expert Professor Thompson during the oral proceedings, and as not disputed by opponent 1, pyrazol or similar structures have a higher triplet level than the acetylacetonate ligand, which is to be avoided according to the teaching of the patent (paragraph ). In fact, opponent 3's experiments even confirm the correctness of this teaching. More specifically, the compound with the highest quantum yield in these experiments (second compound) has, compared to the other compounds, a lower triplet level of the L ligand, due to the fact that it contains a more extended aromatic system. 4.6 Consequently, no undue burden is needed to select those complexes falling under the structural definition given in claim 1 that are phosphorescent. 4.7.1 Opponents 1 and 3 argued that the complexes for which the patent provided emission spectra were not phosphorescent. However, the lifetimes given for these spectra are relatively long, namely in the microsecond range (figure 8: 1.7 μs; figure 10: 4.7 μs; figure 12: < 1 μs; figure 27: 1.4 μs and figure 29: 2 μs). Phosphorescence originates from a triplet to singlet transition, which is forbidden for symmetry reasons, and thus is delayed. The lifetimes reported in the patent are therefore clearly indicative of phosphorescence. In view of the fact that the whole patent deals exclusively with phosphorescent emitters, and in the absence of any proof to the contrary from the opponents, the board has no reason to doubt that the compounds disclosed in the patent and for which no lifetimes are given are also phosphorescent. In this respect, opponents 1's and 3's argument that lifetimes of less than 1 μs and 4.7 μs as given for the complexes in figures 12 and 10 implied according to paragraph  of the patent a non-phosphorescent emission is not persuasive. In paragraph  of the patent it is stated that in most cases the tested iridium complexes had emissions with lifetimes of 1 to 3 μs and that such a lifetime was indicative of phosphorescence. This statement does not allow the reverse conclusion to be drawn that an emission with a lifetime of less than 1 μs or more than 3 μs is automatically non-phosphorescent. 4.7.2 Opponent 1 furthermore argued that the spectra in the patent were partly taken in solution and thus could not prove that the compound tested was phosphorescent in the solid state, as required for organic light-emitting devices (hereinafter OLEDs). This argument is however irrelevant since claim 1 does not require phosphorescence in the solid state. 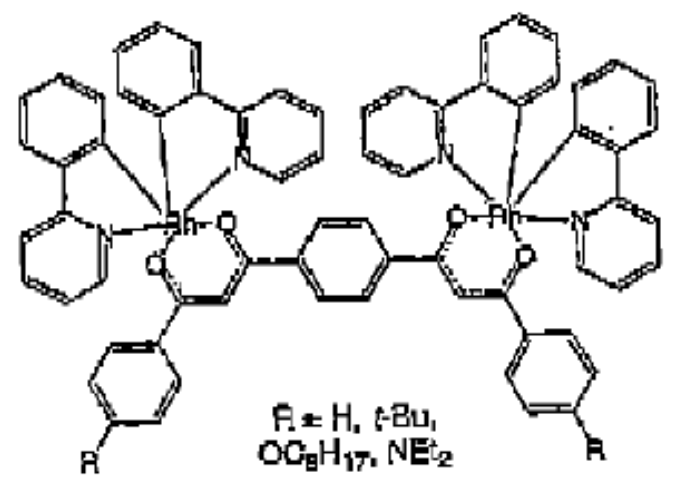 4.7.3 Opponents 1 and 3 argued in writing that complexes with hexafluoroacetylacetonate ligands X as covered by the structure defined in claim 1 were not phosphorescent. More specifically, D8 proved that a complex with two 2-pyridinyl-N-phenyl ligands and one hexafluoroacetylacetonate ligand did not show any emission at all. The board acknowledges that some hexafluoroacetylacetonate compounds with a structure as defined in claim 1 exist that are not phosphorescent. 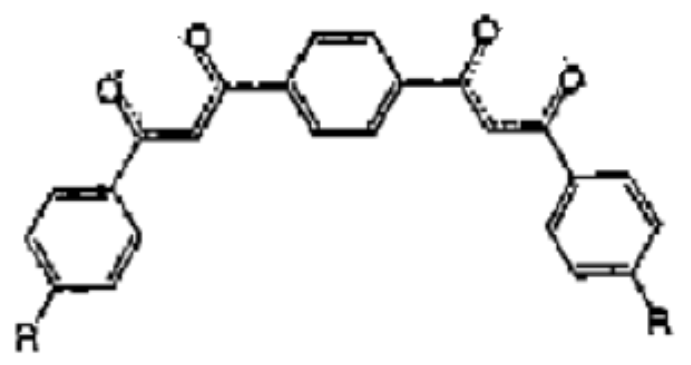 The patent discloses however at least one compound with a hexafluoroacetylacetonate ligand that shows a phosphorescent emission (see figure 16). Contrary to the opponents' assertion, this is not in contradiction to paragraph  of the patent, since this paragraph does not exclude such a compound from showing an emission, although it may be very weak. The skilled person would thus at least know that he has to choose the compound disclosed in figure 16 in order to get phosphorescence with a hexafluoroacetylacetonate ligand. 4.7.4 Opponent 3 additionally argued that the patent did not sufficiently define to what extent the complex according to claim 1 had to emit phosphorescent light in order to qualify as phosphorescent. It is true that claim 1 does not define the extent of phosphorescence. However, this only means that it covers phosphorescent complexes irrespective of whether their emission is weak or strong, which is an issue of broadness rather than clarity, let alone sufficiency. Furthermore, even if the extent of phosphorescence were unclear in claim 1, this in itself would not lead to any insufficiency of disclosure (T 593/09, catchword and point 4.1.4 of the reasons). 4.7.5 Opponent 3 lastly argued that phosphorescence was dependent on numerous conditions such as temperature, environment and the concentration of the complex. However, the opponent has not provided any proof for its assertion. It has in particular not shown that the alleged lack of clarity is present to such an extent that the feature "phosphorescent" is deprived of any real meaning, such that it does not function as a selection criterion for the identification of suitable complexes. Therefore, this argument of the opponent is, if anything, also only concerned with lack of clarity. 4.7.6 During the oral proceedings, opponent 1 raised the objection that it was not possible to measure the energy of the triplet levels of the L and X ligands. The skilled person thus would not know whether he was following the teaching of the patent that the triplet level of the L ligand should be lower than that of the X ligand (see point 4.5 above). The proprietor had already argued in its response to the grounds of appeal (paragraph bridging pages 18 and 19 of its letter of 22 December 2014) that the energy levels of the triplet states of the L and X ligands had to be properly adjusted to obtain phosphorescent emission. Nevertheless, opponent 1 waited more than one year, namely until the oral proceedings before the board, to provide its counter-argument that the energy levels of the ligands' triplet states could not be determined. The board therefore followed the proprietor's request and did not admit this objection into the proceedings. 4.8 In view of the above, the ground under Article 100(b) EPC does not prejudice the maintenance of the patent on the basis of the main request. 4.9 The proprietor had requested during the written proceedings that if the board were to decide that, due to the allegedly unclear meaning of the term "phosphorescence", the claimed invention was insufficiently disclosed, a referral should be made to the Enlarged Board of Appeal. Since the board decides in the proprietor's favour that the invention defined in the main request is sufficiently disclosed, even accepting the alleged ambiguity of the term "phosphorescent", there is no need to decide on the proprietor's request for a referral. 5.1 Opponents 1 and 3 contested novelty of the subject-matter of the main request in view of D57 and D58. This issue will be dealt with in point 11 below. 5.2 Opponents 1 and 3 furthermore contested novelty in view of D3, D6, and D54. For the iridium complex, the structure can be assumed to be identical except that the rhutenium atoms are replaced by iridium atoms. to ligand X of the L2IrX compound of claim 1. However, contrary to claim 1, the acetylacetonate ligand in this structure is not a monoanionic bidentate ligand. More specifically, the acetylacetonate ligand contains two diketo groups with four keto-moieties ("dents") and one delocalised negative charge per diketo group, i.e. four dents and two charges in total. The ligand in D3 thus is tetradentate and dianionic and therefore does not correspond to the bidentate monoanionic ligand X as defined in claim 1. 5.3.2 The subject-matter of claim 1 and by the same token of all remaining claims is thus novel over D3. 5.4 D6 discloses the reaction of Ir(acac)3 to Ir(ppy)3 by refluxing iridium triacetylacetonate Ir(acac)3 and phenylpyridine Hppy in glycerol under nitrogen for 10 hours, precipitating the resulting product by cooling, adding HCl and purifying it. Figure 1 presents a reaction scheme for this showing the sequential substitution of the three acetylacetonate (acac) ligands by phenylpyridine. Accordingly, one of the described intermediate products is Ir(ppy)2acac, which corresponds to a phosphorescent compound as defined in claim 1. 5.4.1 Opponents 1 and 3 argued that, since D6 explicitly disclosed the claimed compound as part of a reaction mechanism (intermediate product Ir(ppy)2acac), it was novelty-destroying. As set out in T 719/12 (keyword and point 2 of the reasons), the disclosure of a compound does not in itself make the compound available to the public. The board in that case emphasised that the compound which was allegedly novelty-destroying was merely postulated in a prior-art document which taught neither how to isolate nor how to obtain it (see in particular point 2.2 of the reasons). In the present case, the reaction scheme in D6 is of a rather theoretical nature. It does not contain any information about how the intermediate product could be isolated or obtained. As in the case underlying T 719/12, it thus does not make this intermediate product available to the public. 5.4.2 As regards novelty over D6, the opponents relied on D55 and D56. The proprietor requested that D55 and D56 not be admitted into the proceedings. The opponents filed the two documents to show that the intermediate product postulated in D6 was indeed obtained and that D6 was therefore novelty-destroying. This line of argument constitutes a continuation of the novelty attack already made on the basis of D6 during the opposition proceedings and addresses directly the reason given by the opposition division as to why D6 was not novelty-destroying. Since this line of argument was furthermore filed at the earliest possible moment in the appeal, namely with opponent 3's statement of grounds of appeal, the board decided to admit D55 and D56 into the proceedings. 5.4.3 Opponents 1 and 3 argued in particular that D55 confirmed that the claimed product was indeed formed as an intermediate during the reaction of D6. The board does not find this argument persuasive. D55 is a theoretical study on the synthesis mechanism of fac-[Ir(ppy)3] from [Ir(acac)3] (title), which is the reaction described in D6. D55 mentions five possible reaction paths A to E for this reaction, of which only the last one leads to the formation of Ir(ppy)2acac as an intermediate product (compound (5) on page 11). As set out in the conclusion on page 12, the work done in D55 used theoretical calculations at the B3LYP/SDD level of theory. Hence, like the reaction scheme in D6, D55 is based on theoretical considerations. 5.4.4 Opponents 1 and 3 further argued that the reaction disclosed in D6 had been repeated in D56, and after a reaction time of one hour a sample had been taken which contained traces of the claimed product, as confirmed by mass spectroscopy. The claimed product was thus indeed formed as an intermediate during the reaction disclosed in D6. However, in D6 the reaction time was ten hours rather than one (first sentence of the second paragraph in the left-hand column on page 1686 of D6) and there is no teaching at all in D6 to stop the reaction earlier than that. In fact, it is even doubtful whether it would be possible at all to stop the reaction disclosed in D6 so that Irppy2acac could be isolated and obtained. In this respect the board has no reason to doubt the proprietor's explanation during the oral proceedings that the reaction of D6 was kinetically driven and that the rate-determining step was the first step in the reaction scheme depicted in D6, i.e. the reaction of Iracac3 to Irppyacac2, with the subsequent substitution of the further two acetylacetonate ligands being so fast that an isolation of the "intermediate" Irppy2acac was impossible. Therefore, the subject-matter of claim 1 and by the same token of all remaining claims is novel over D6. This finding is not at variance with decision T 327/92, cited by the opponents. In the case underlying that decision a laminate was stretched in one direction and then, 60 seconds later, it was stretched in a second direction perpendicular to the first one. The laminate before the second stretching was considered to be novelty-destroying by the board (point 2.2. of that decision). That case differs from the present one in that the laminate before the second stretching existed as a discrete product that disappeared only after a further step was taken. In the present case however there are no two distinct steps in D6, with the claimed product resulting after the first step. On the contrary, what D6 describes is a continuous refluxing process during which a compound, if it existed at all, was only present as a transient rather than a discrete intermediate product. This approach was also applied in decision T 392/06, cited by the proprietor during the oral proceedings in support of its view that D6 was not novelty-destroying. In that case, the board stated that a slurry obtained at the end of a fourth step of a five-step process before filtration, washing and sucking dry could be novelty-destroying even if the skilled person had no particular reason to stop the process at that point (point 5 of the reasons). In the same way as for T 327/92, the slurry existed during this multistep process as a discrete product, unlike the transient product in the reaction of D6. 5.4.5 Lastly, this conclusion is not at variance with opponent 1's argument that it was common in the art of synthesising organic molecules to take samples every hour to check how far the reaction had proceeded. The skilled person carrying out the teaching of D6 would thus have automatically taken a sample after one hour and thereby would have obtained Ir(ppy)2acac. The opponent has however not supported this assertion by any documentary evidence. In view of this, and since D6 explicitly teaches a reaction time of 10 hours without taking samples in between, the opponent's argument must fail. 5.4.6 It thus continues to hold true that the subject-matter of claim 1 and by the same token of all remaining claims is novel over D6. 5.5 D54 (table II, first and second complex) discloses dichloro-bridged complexes [Ir(ppy)2Cl]2 and [Ir(bzq)2Cl]2. 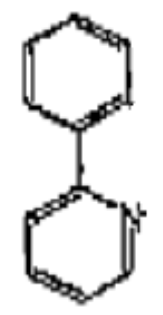 Opponent 1 argued that this structure could be split into a ppy2Ir part corresponding to L2Ir in claim 1 and a Cl2Irppy2 part corresponding to the monoanionic bidentate ligand X, with the two Cl atoms of the Cl2Irppy2 part representing the two dents. The board acknowledges that on paper and leaving any technical considerations aside, the opponent's argument appears at first glance correct. However, this argument ignores the technical content of the above structure in D54. As explained by the proprietor's expert Professor Thompson during the oral proceedings, and as not disputed by opponent 1, the above structure represents a dimeric molecule of two ppyIrCl monomers that coexist in the form of a resonance structure. Hence, the two bonds from the two Cl atoms to one Ir atom represent a resonance between two monomers, and not two dents of a bidentate ligand as required by claim 1. Thus, if the above symmetric structure were to be mentally split into two parts, this would result in two identical monomers ppy2IrCl, rather than the two unequal parts ppy2Ir and Cl2Irppy2 derived from the purely theoretical split proposed by opponent 1. That the above structure of D54 does not correspond to a compound L2MX as defined in claim 1 is confirmed by the patent, paragraph  of which discloses a compound of the above structure, namely L2M(μ-Cl)2ML2, as the starting material to prepare the claimed structure L2MX. The subject-matter of claim 1, and by the same token of all remaining claims, is thus novel over D54. 6.1 The invention underlying the patent is directed to OLEDs with phosphorescent emitters (paragraphs  to ). 6.2 Like the patent, D2 refers to phosphorescent OLEDs (second paragraph of the left-hand column on page 4). Therefore, in line with the arguments of all parties, D2 can be considered to represent the closest prior art. D2 describes the performance of an OLED containing, as a luminescent layer, the organometallic iridium compound Irppy3 doped into a CBP (4,4'-N,N'-dicarbazole biphenyl) host (abstract and penultimate paragraph of page 4). This layer is located between a cathode and an anode (first paragraph of the left-hand column on page 5). The organometallic compound of claim 1 differs from that of D2 in that only two rather than all three ligands of the metal are the same, i.e. in that it is a heteroleptic (L2MX) and not a homoleptic compound (L3M). 6.2.1 The proprietor argued that the objective technical problem solved in view of D2 was to allow for colour tuning of OLEDs. This issue is addressed in the patent in paragraph  and section V.B.4 "Color Tuning". 6.2.2 As a solution to this problem, the patent proposes the complex of claim 1, which is characterised in that it contains the phosphorescent organometallic heteroleptic compound L2MX rather than the homoleptic compound L3M of D2. "The picolinic acid derivatives that we have prepared thus far show a small blue shift (15 nm) in their emission spectra relative to the acac and salicylanilide complexes of the same ligands." In view of this, and in the absence of any proof to the contrary, the problem of tuning the emission colours of OLEDs has been credibly solved over D2. This thus represents the objective technical problem. 6.2.4 It remains to be examined whether the claimed solution is obvious. D2 does not address the problem of tuning emission colours of OLEDs. Furthermore, D2 does not contain any motivation to replace one of the three identical ppy ligands of Irppy3 with a different one, let alone suggest that thereby emission colours of OLEDs could be tuned. Opponents 1 and 3 argued that the claimed solution was obvious over D2 since this document stated, in the last paragraph of the left-hand column on page 6, that new phosphorescent compounds deserved intensive investigation. The skilled person would therefore have looked for complexes different from Irppy3. He would furthermore have known that exchanging one of the three identical ligands in the Irppy3 complex of D2 would have resulted in a colour shift. Therefore, the skilled person not only could but also would have arrived at the claimed solution. This argument is not persuasive. Even if the skilled person envisaged modifying the Irppy3 complex of D2, he could have done so in various ways, e.g. by changing the metal present in the complex or by exchanging all three identical ligands for three different ones. Consequently, the claimed solution is not obvious in view of D2 alone. Opponents 1 and 3 argued that the subject-matter of claim 1 was obvious in view of D2 in combination with D3. However, as set out above, D3 does not disclose a structure as defined in claim 1. Furthermore, D3 does not suggest that this structure can be incorporated into an OLED, let alone that thereby the emission colours of an OLED could be changed. Opponents 1 and 3 furthermore argued that the subject-matter of claim 1 was obvious in view of D2 in combination with D5. This document is a scientific article disclosing the synthesis of iridium complexes. Even if one assumes in the opponents' favour that the skilled person reading D5 would consider these compounds to be phosphorescent, the subject-matter of claim 1 is not obvious in view of D2 and D5. Firstly, D5 is in a technical field completely unrelated to that of OLEDs, namely that of biological marker molecules. The skilled person starting from D2 and confronted with the objective technical problem would thus not even have considered D5. Secondly, even if he had looked into D5, he would not have found any motivation to use the compounds disclosed there, instead of that disclosed in D2, in order to change the emission colours of OLEDs. Lastly, even if he had done so, he would not have arrived at the subject-matter of claim 1, since the specific iridium compounds disclosed in D5 as complexes 16 to 21 (page 192) have been disclaimed (see points 10.1.1 and 10.1.2 below). Opponent 1 further argued that the claimed subject-matter lacked inventive step in view of D2 in combination with D6. However, D6, like D2, refers to the preparation of the homoleptic compound Irppy3. The skilled person applying the teaching of D6 to D2 would thus not arrive at the claimed heteroleptic compound. Opponents 1 and 3 additionally argued that the subject-matter of claim 1 was obvious in view of D2 in combination with D7. D7 is a PhD thesis that discloses the synthesis of the complex IrMPPY2PIC, which has a formula according to claim 1. Upon UV irradiation in dichloromethane, a bright green glow is observed (second sentence on page 286). Even if one assumes in the opponents' favour that this implies phosphorescence, the subject-matter of claim 1 is not obvious from D2 and D7. More specifically, D7 is in an entirely different technical field from OLEDs, namely photochemistry (see reference to the redox potential of the excited state in the last sentence of page 286 of D7). The skilled person would therefore not even have considered D7. Furthermore, even if the skilled person had considered this document, he would not have found any indication that by replacing the compound of D2 with that of D7 he would have solved the problem of changing the emission colours of OLEDs. Lastly, even if he had done so, he would not have arrived at the subject-matter of claim 1, since the specific compound IrMPPY2PIC disclosed in D7 has been disclaimed (see points 10.1.1 and 10.1.3 below). 6.2.5 Consequently, the subject-matter of claim 1 and by the same token of all remaining claims is inventive in view of D2, whether alone or in combination with any of the further cited documents. "Pure Appl. Chem. Vol. 71, No. 11, pp. 2095-2106, 1999. Printed in Great Britain © 1999 IUPAC". This seems to indicate that D4 was published within the priority year of the patent (1999). However, Ms Meyers, associate director of the International Union of Pure and Applied Chemistry, stated in her letter D51 that "the November 1999 issue (Vol. 71, No. 11) was printed on July 5, 2000" and that there was no release online before printing. The issue referred to in this letter is the one containing D4. D4 was thus published on 5 July 2000, i.e. after the priority date of the patent. Hence, provided the priority is valid, D4 is not prior art under Article 54(2) EPC and thus not relevant to inventive step. Irrespective of this, taking D4 as the closest prior art does not alter the finding on inventive step. Like D2, it is directed to phosphorescent OLEDs and discloses Irppy3. Hence, the same distinguishing feature is present and the same objective technical problem applies as with regard to D2. 6.4 Lastly, opponent 1 argued in writing that it would have been obvious to reduce the reaction time in D6 so that the skilled person obtained a complex as defined in claim 1. However, firstly, D6 is a paper dedicated to the synthesis of complexes and is not related at all to any emission properties. Therefore it is not the closest prior art. Secondly, D6 aims at the synthesis of homoleptic compounds with three identical ligands and discloses the claimed heteroleptic compound only as an intermediate in a hypothetical reaction scheme (see novelty discussion above). D6 in particular does not provide any motivation to reduce the reaction time in order to obtain this intermediate homoleptic compound, let alone to do so to solve the problem of colour tuning. Opponent 1's argument thus must fail. 6.5 The subject-matter of all claims is thus inventive over the cited prior art. wherein the ligand is an α-amino acid residue selected from glycine, L-alanine, L-valine, D-leucine, L-proline, or L-phenylalanine,"
7.2 It was undisputed that both disclaimers were undisclosed disclaimers. "An amendment to a claim by the introduction of a disclaimer may not be refused under Article 123(2) EPC for the sole reason that neither the disclaimer nor the subject-matter excluded by it from the scope of the claim have a basis in the application as filed" (answer No. 1). 2.4 A claim containing a disclaimer must meet the requirements of clarity and conciseness of Article 84 EPC." These criteria, in the present board's understanding, define specific exceptions from the requirements of Article 123(2) EPC. Even though G 1/03 did not explicitly refer to "exceptions" in this context, later case law refers to the "exceptions" laid down in G 1/03 (see, e.g., T 1107/06, point 42 of the reasons). "The test to be applied is whether the skilled person would, using common general knowledge, regard the remaining claimed subject-matter as explicitly or implicitly, but directly and unambiguously, disclosed in the application as filed" (second paragraph of point 4.5.4 of the reasons; underlining added by the present board). The Enlarged Board then went on to state in the next paragraph of G 2/10 that "This test is the same as that applied when the allowability of a limitation of a claim by a positively defined feature is to be determined", a test which was established in opinion G 3/89 and decision G 11/91, relating to amendments by way of correction (point 3 of the reasons of G 3/89 and G 11/91). As pointed out in the last paragraph of point 4.3 of G 2/10, this definition "has become the generally accepted, one could also say the "gold" standard, for assessing any amendment for its compliance with Article 123(2) EPC". 7.5 Although the question referred to the Enlarged Board in G 2/10 concerned "disclosed disclaimers" only, there are numerous passages in G 2/10 which suggest that the gold standard applies to any amendment (including undisclosed disclaimers) when assessing its compliance with Article 123(2) EPC. "The importance and the applicability, without exception, of Article 123(2) EPC was underlined in the jurisprudence of the Enlarged Board of Appeal as early as in its opinion G 3/89 and decision G 11/91 (OJ EPO 1993, 117 and 125, relating to amendments by way of correction). From these rulings it follows that any amendment to the parts of a European patent application or of a European patent relating to the disclosure (the description, claims and drawings) is subject to the mandatory prohibition on extension laid down in Article 123(2) EPC and can therefore, irrespective of the context of the amendment made, only be made within the limits of what a skilled person would derive directly and unambiguously, using common general knowledge, and seen objectively and relative to the date of filing, from the whole of these documents as filed, points 1., 1.3 and 3. of the Reasons" (underlining by the present board). "... neither decision G 1/93 nor decision G 1/03 intended to modify the general definition of the requirements of Article 123(2) EPC established in opinion G 3/89 and decision G 11/91 ..."
This can, in the present board's view, only mean that the gold standard must also apply to undisclosed disclaimers as dealt with in G 1/03. 7.5.3 Lastly, in point 4.7 of G 2/10, the Enlarged Board addressed the President's suggestion that where the subject-matter remaining in the claim was not directly and unambiguously derivable from the application as filed, the criteria established in decision G 1/03 should be applied for the allowability of the disclaimer. "As can be derived from the Enlarged Board's position in the foregoing, in accordance with the principles developed in the above-cited earlier rulings of the Enlarged Board, the overriding principle for any amendment to be allowable under Article 123(2) EPC is that the subject-matter of an amended claim must be at least implicitly disclosed to the skilled person, using common general knowledge, in the application as filed. As has also been set out in the foregoing, that applies equally to the subject-matter of a claim the scope of which is determined by a disclaimer" (second paragraph of point 4.7 of the reasons). 7.6 Thus, taking the Enlarged Board's remarks in G 2/10 to their logical conclusion, this would mean that there is only one test to be applied for assessing any amendment, including an undisclosed disclaimer, for its compliance with Article 123(2) EPC, namely the gold standard. In other words, also for undisclosed disclaimers the relevant standard would be whether the skilled person would, using common general knowledge, regard the subject-matter remaining in the claim after the introduction of the disclaimer as explicitly or implicitly, but directly and unambiguously, disclosed in the application as filed. "... to restrict the effect of the earlier application as far as possible in order to avoid unfairness resulting from the concept of a fictional publication" (last paragraph of point 2.1.1 of the reasons). In a subsequent part of its decision the Enlarged Board extended this rationale to accidental anticipations (see in particular the second paragraph of point 2.2.2 of the reasons). The present board notes that the legislator already restricted the effect of an earlier application under Article 54(3) EPC in the law itself, namely by the provision of Article 56 EPC that documents within the meaning of Article 54(3) EPC are not to be considered in deciding on inventive step. However, Article 123(2) EPC - unlike Article 56 EPC - has never contained, either in EPC 1973 or following the EPC 2000 revision, any special provisions for claims containing undisclosed disclaimers in view of documents within the meaning of Article 54(3) EPC. No legislative intent is thus derivable from Article 123(2) EPC that this type of amendment should be treated any differently from others. "The state of the art shall be held to comprise everything made available to the public by means of a written or oral description, by use, or in any other way, before the date of filing of the European patent application." 7.8 In summary, the present board's conclusion from G 2/10 is that there is only one standard, namely the gold standard, for assessing any amendment, including undisclosed disclaimers, for compliance with Article 123(2) EPC. This conclusion leaves no room for the exceptions defined in decision G 1/03, because also for undisclosed disclaimers the only relevant test would be the gold standard. Only if this standard is met would the disclaimer be allowable under Article 123(2) EPC. However, even after extensively discussing G 1/03 and implying the relevance of the gold standard to undisclosed disclaimers, the Enlarged Board in G 2/10 did not set aside G 1/03 with regard to the exceptions relating to undisclosed disclaimers defined in answer 2.1 of that decision. 8.1 If the gold standard of G 2/10 were to be applied to claims containing undisclosed disclaimers (first question answered in the affirmative), then an undisclosed disclaimer would in the present board's view in most cases not be allowable under Article 123(2) EPC. A disclaimer excluding undisclosed subject-matter almost by definition contravenes Article 123(2) EPC. If a whole is reduced by an undisclosed first part, the present board fails to see how the remaining second part could ever be regarded as explicitly or implicitly, but directly and unambiguously, disclosed in the application as filed. This can be illustrated by the following simple example: if one takes a bite out of an apple, what remains is recognisably no longer the same apple as the original one. Even though it is still an apple, the apple with the bite taken out of it cannot be regarded as explicitly or implicitly, but directly and unambiguously, "disclosed" in the original apple. "... any schematic reasoning solely suggesting that the introduction of the disclaimer modifies the subject-matter remaining in the claim because that amended claim contains less than the unamended claim would also not be sufficient to motivate an objection under Article 123(2) EPC" (second paragraph of point 4.5.3 of the reasons). 8.1.2 However, according to the Enlarged Board's own reasoning in G 2/10, the relevant question to be asked for disclosed (and undisclosed) disclaimers is whether the skilled person would, using common general knowledge, regard the subject-matter remaining in the claim after the introduction of the disclaimer as explicitly or implicitly, but directly and unambiguously, disclosed in the application as filed. Even the proprietor acknowledged at the oral proceedings that, if one followed the gold standard of G 2/10 in that way, undisclosed disclaimers would no longer be allowable. "Any amendment to a claim is presumed to have a technical meaning, otherwise it would be useless to have it in the claim. In any event, a feature without a technical meaning would not restrict the scope of a claim" (second paragraph of point 2 of the reasons). This statement was made to refute the most far-reaching argument brought forward in favour of undisclosed disclaimers, namely that it is a mere voluntary restriction by which the applicant abandons part of the claimed subject-matter and that, therefore, an undisclosed disclaimer per se is not a technical feature of the claim, and thus can never infringe Article 123(2) EPC. Excluding subject-matter from a claim by way of an undisclosed disclaimer hence does change the technical content of the claim, so that in view of the gold standard it can be objected to under Article 123(2) EPC. 9.1 As apparent from the above, it is in the present board's view questionable whether or not undisclosed disclaimers have to pass the gold standard to be allowable under Article 123(2) EPC. The present board has therefore examined whether the case law after G 2/10 clarifies this issue. 9.1.1 In decision T 74/11 (point 4.8 of the reasons) the exceptions of G 1/03 were applied as sole criteria to undisclosed disclaimers. Even though this decision was issued after G 2/10, the gold standard was thus not applied. 9.1.2 To the board's knowledge, all other decisions have interpreted the remarks in G 2/10 as an instruction to apply the gold standard as a further test in addition to the principles set out in G 1/03. 9.1.3 In T 748/09 the board appears to have applied the gold standard in the way outlined in point 7.4 in conjunction with point 8.1 above, concluding that the undisclosed disclaimer did not meet this standard.
" ... by introducing into claim 2 the compositional restrictions, which are exclusively based on document D1 rather than on the technical disclosure of the application, the skilled person is confronted with new subject-matter that he cannot derive clearly and unambiguously from the application as originally filed. To give an example, it is noted that the upper limit of less than 50% niobium now featuring in claim 1 is not disclosed anywhere in the application as filed and neither are the limits of less than 0.5% Zr and more than 5% Zr. It follows from the above considerations, that the disclaimer of claim 2 of the auxiliary request 1 does not satisfy the requirements of Article 123(2) EPC. Hence claim 2 of the new main request is not allowable" (point 2.2.3 of the reasons). In T 2464/10, the board decided that a disclaimer of humans from animals ("non-human animal") passed the gold standard, in view of a disclosure in the application as filed of animals, preferably a mammal, and more preferably a transgenic pig or a transgenic sheep. In its reasoning, the board held that the limitation to non-human animals did not provide any new technical teaching and the skilled person was not presented in the application as filed with any new disclosure which went beyond the application as originally filed (point 8.1.1 of the reasons). "The exclusion of human embryonic stem cells does not introduce a new technical teaching nor does it lead to the disclosure of any subject matter going beyond the application as filed. Therefore, the disclaimer also satisfies the condition set out in point 1a of the order of decision G 2/10 (OJ EPO 2012,376; cf. decision T 2464/10 of 25 May 2012)" (point 5 of the reasons). In T 1872/14 (point 5.3.3 of the reasons), the board allowed a disclaimer excluding one specific composition from a claimed ophthalmic composition, which had been introduced into the claims to restore novelty over a document under Article 54(3) EPC. The board considered the disclaimer to meet the gold standard of G 2/10 since "the technical information presented to the skilled person has not been modified, in the sense that the disclaimer does not result in a singling out of a novel subgroup in the subject-matter remaining in the claim" and "since the identity of the claimed subject-matter has not been changed by said amendment" (underlining added by the present board). "Damit umfasst Anspruch 1, nach Einführung des Disclaimers, noch immer einen realen Gegenstand, der die Erfindung und ihre Ausführung ermöglicht. Darüber hinaus gibt die Anmeldung keinen Hinweis, dass der Fachmann diesen verbleibenden Gegenstand in Anspruch 1 als nicht zur Erfindung gehörend erachtet hätte. Die Kammer schließt daraus, dass der im Anspruch verbleibende Gegenstand für den Fachmann in der ursprünglich eingereichten Anmeldung offenbart war und somit die Erfordernisse von Artikel 123(2) EPÜ im Lichte der Entscheidungen von G 1/03 und G 2/10 erfüllt sind" (point 3 of the reasons). In T 1870/08, when deciding whether a disclaimer met the gold standard, the board examined, inter alia, whether (i) the subject-matter remaining in the claim after the disclaimer could plausibly be considered as belonging to the invention, (ii) it still solved the technical problem underlying the original invention, and (iii) the disclaimer did not provide the proprietor with any unwarranted advantage (fourth paragraph of point 4.6.7, point 4.7.1 and third paragraph of point 4.7.2 of the reasons). For instance, in order to decide whether the remaining subject-matter in a claim still solved the technical problem underlying the original invention (one of the criteria applied in T 1870/08), the applicant or proprietor would have to show, e.g. by submitting comparative tests, that the effect(s) obtained by the remaining subject-matter of the claim was (were) the same as that (those) obtained before the disclaimer had been introduced. That is different from the gold standard, which for "normal" amendments has never made the requirements of Article 123(2) EPC dependent on any experimentally proven effect(s). "This may convey the impression that the two decisions [G 1/03 and G 2/10] contradict, given that an undisclosed disclaimer - as part of the definition of the claimed subject-matter - could obviously not have been disclosed to the skilled person in the application as filed. 9.1.7 Hence, the case law after G 2/10 is not uniform as regards whether the gold standard is to be applied and, if so, what standard exactly needs to be applied for the allowability of undisclosed disclaimers under Article 123(2) EPC. 9.2 In summary, the fundamental question of law whether the findings in G 2/10 apply also to undisclosed disclaimers and the diverging case law following G 2/10 justify the referral questions. 10.1 If the gold standard is not to be applied to undisclosed disclaimers, i.e. the first referral question is answered in the negative, then the present board assumes that the exceptions to the requirements of Article 123(2) EPC as developed in G 1/03 apply. 10.1.1 The proprietor introduced the two disclaimers into claim 1 in order to disclaim novelty-destroying subject-matter disclosed in D5 (first disclaimer) and D7 (second disclaimer). wherein the ligand is an α-amino acid residue selected from glycine (structure 16), L-alanine (structure 17), L-valine (structure 18), D-leucine (structure 19), L-proline (structure 20), or L-phenylalanine (structure 21). The two phenyl-pyridine ligands correspond to ligand L and the amino acid residues to ligand X as defined in claim 1. The compounds disclosed in D5 thus have a structure as defined in claim 1. It was furthermore common ground between the parties that these compounds were phosphorescent as required by claim 1. The compounds disclosed in D5 would therefore be novelty-destroying to the subject-matter of claim 1, had they not been excluded by the first disclaimer. 10.1.3 D7 discloses on page 285 a compound Ir(MPPY)2PIC. The ligands MPPY correspond to ligand L and PIC to ligand X as defined in claim 1, so that the compound disclosed in D7 anticipates the structure as defined in claim 1. It was common ground between the parties that this compound was phosphorescent as required by claim 1. The compound disclosed in D7 would thus be novelty-destroying, had it not been excluded from claim 1 by the second disclaimer. 10.1.4 The proprietor argued that, since D5 and D7 - which are both prior art under Article 54(2) EPC - were accidental anticipations, the disclaimers were allowable under G 1/03. 10.1.5 It was common ground between opponent 1 and the proprietor that the two disclaimers met criteria 2.2 to 2.4 of answer 2 of G 1/03 (see point 7.3 above), and the board is satisfied that these criteria are indeed met. It was however a matter of dispute whether D5 and D7 were accidental anticipations (one of the criteria set out in answer 2.1 of G 1/03). 10.1.6 According to G 1/03, an anticipation is accidental if it is "so unrelated and remote that the person skilled in the art would never have taken it into consideration when working on the invention" (point 2.2.2 of the reasons). According to the Enlarged Board, a typical situation is the following: the claimed invention concerns a large group of chemical compounds with certain properties which are advantageous for a specific use. One single compound falling within the group turns out to be known for a completely different use and, therefore, only properties irrelevant to the new use are known (point 2.2.1 of the reasons). 10.1.7 D5 relates to the marking of peptides (fifth paragraph in the right-hand column of page 192). The compounds disclosed in D5 must thus bind to peptides to mark them, so that later, upon irradiation with light, they give a response, thereby revealing the proteins' presence. Consequently, what is needed in D5 is phosphorescence induced by radiation. The technical field of marking peptides is entirely different from the patent's field, namely OLEDs. Furthermore, the property of being phosphorescent upon irradiation with light in D5 is irrelevant to the property aimed at in the patent for use in OLEDs, namely that of being phosphorescent when an electrical voltage is applied. Opponents 1 and 3 argued that D5 disclosed that a characteristic of complexes 16 to 21 were strong metal-to-ligand charge transfer bands at 350 to 450 nm. This type of band was indicative of phosphorescence and thus relevant to the use intended in the patent. D5 was therefore not an accidental anticipation. The opponents' argument is however not convincing. Even if one agrees with the opponents that the metal-to-ligand charge transfer bands disclosed in D5 are indeed indicative for phosphorescence, it is phosphorescence induced by light irradiation, whereas the patent aims at a different property, namely phosphorescence induced by an electrical voltage. Hence, the technical field of D5 is entirely different from that of the patent and the properties disclosed in D5 are irrelevant for the use intended in the patent. The skilled person would thus never have taken D5 into consideration when making the invention. D5 thus is an accidental anticipation under Article 54(2) EPC. 10.1.8 D7 is in the field of photochemistry and discloses that the complex IrMPPY2PIC described therein "may provide means of "tuning" the exited state redox potential by adjusting the pH" (last sentence of page 286 of D7). Thus D7 is in a different technical field from the opposed patent, namely that of compounds with photo-redox properties. The opponents argued that on page 286 D7 disclosed that IrMPPY2PIC showed a "bright green glow" upon room-temperature UV radiation. Hence, D7 disclosed the property of emitting light and this was not irrelevant for the use in OLEDs as intended in the patent. However, in the same way as for D5, the light emission disclosed in D7 is phosphorescence induced by irradiation rather than by electrical voltage and thus is irrelevant to the use intended in the patent. Therefore, the skilled person would never have taken D7 into consideration when making the invention. Hence, also D7 is an accidental anticipation under Article 54(2) EPC. 10.1.9 Consequently, also the criterion of answer 2.1 of G 1/03 for accidental anticipations is fulfilled. Hence, if the exceptions of G 1/03 apply, i.e. the first referral question is answered in the negative, the amendment introduced into claim 1 by the two disclaimers complies with Article 123(2) EPC. 10.2 If, on the other hand, the gold standard of G 2/10 is to be applied, i.e. the first referral question is answered in the affirmative, and in particular if it is to be applied in the way outlined in point 7.4 in conjunction with point 8.1 above, i.e. if the third referral question is answered in the negative, then in the present board's opinion the amendment introduced into claim 1 by the two undisclosed disclaimers is not allowable under Article 123(2) EPC. As set out above (point 8.1.2), this was even acknowledged by the proprietor. 10.3 If the gold standard of G 2/10 has to be applied in modified form, i.e. if the first and third referral questions are answered in the affirmative, one might accept the proprietor's argument that the two disclaimers are allowable since they reduce only slightly the broad genus of compounds covered by claim 1. 10.4 Thus, depending on the answers to the above referral questions, the two disclaimers in claim 1, and with it the main request, are allowable (if only the standard under G 1/03 has to be applied or if the gold standard is to be applied in modified form) or not (if the gold standard has to be applied as outlined in point 7.4 in conjunction with point 8.1 above), provided novelty over D57 and D58 can be acknowledged (see point 11 below). 11.1 Opponent 3 contested novelty on the basis of D57 and D58. 11.2 D57 and D58 disclose compounds as defined in claim 1 of the patent. For instance, the iridium(III) bis(phenylpyridine) acetylacetonate disclosed in figure 19 of both D57 and D58 anticipates the compound L2IrX as defined in claim 1, with the phenylpyridine corresponding to ligand L and the acetylacetonate corresponding to ligand X. 11.3 It was a matter of dispute whether D57 and D58 were prior art under Article 54(2) EPC, in which case they would indeed be novelty-destroying. 11.3.1 Both the patent and D57 and D58 claim the same priority date, namely 1 December 1999 (the patent is the parent application of D57 and D58). Whether D57 and D58 are prior art thus boils down to whether the priority claim of the patent is invalid. 11.3.2 What distinguishes claim 1 of the main request from the disclosure of the priority document in the same way as from that of the application as filed are the two disclaimers. Opponents 1 and 3 argued that due to this difference, claim 1 and the priority document did not refer to the same invention, and the priority of claim 1 was therefore not valid (Article 87(1) EPC and G 2/98). 11.4 In the present board's opinion, the question whether the two disclaimers render the priority of claim 1 invalid depends on the answers to the above referral questions. More specifically, if the standard of G 1/03 is to be applied as sole standard or together with the gold standard in a modified form, claim 1 would meet the requirements of Article 123(2) EPC (see points 10.1 and 10.3 above) and, as a matter of consistency, its priority would be valid. If the gold standard of G 2/10 is to be applied as sole standard in the way outlined in point 7.4 in conjunction with point 8.1 above, claim 1 would not meet the requirements of Article 123(2) EPC (see point 10.2 above), so the priority question would be moot. The present board has therefore not yet decided on the admission of D57 and D58, which was contested by the proprietor on the ground they lacked prima facie relevance, and on the novelty attacks related thereto.